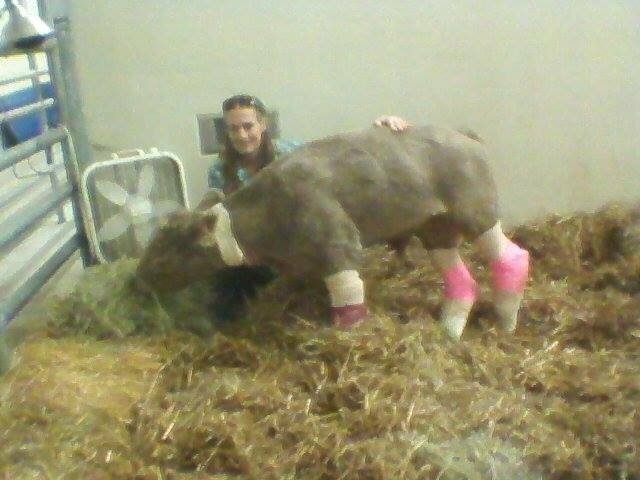 Vets at A&M's Large Animal Hospital reshaped the calf's stumps so it will be able to comfortably wear prosthetic legs, according to Angela Clandenin, Director of Communications & Public Relations for the College of Veterinary Medicine. "Similar procedures have been done in humans and in horses," said Clandenin. "This was an extremely complicated case. This is a case where we have to work very closely with the owner to develop that appropriate treatment plan for Hero." Hero had been abandoned by his previous owner, and was taken in by Kitty Martin of Selah Ranch All Animal Rescue in Hearne, Texas, and plans to pay the $7,000 surgery bill through donations. You can see more images of Hero on Selah Ranch's Facebook page.